Hey everyone, I've got a special treat for you today. I asked Trent if he would do me the honor of writing a post to describe some of the reasons why we are taking this step into foster care instead of having biological children at this point in our life. This path for us didn't begin this summer when we decided to pursue it actively. It didn't begin a year and a half ago when we found ourselves discussing adoption for the first time. It began 27 years ago, when Trent was a child in need of a home and a loving family. 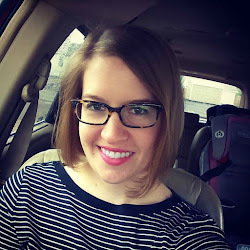 When Anna asked me to guest blog for this post, I wasn't exactly sure where to start. She gave me the basic prompt, “Why not biological children?” Where do I start? How do I get a complex decision like that on paper? Then I realized, I should start from exactly where I started: my parents. My mom and dad were forced into adoption. After losing their first two biological children to muscular dystrophy, they decided to adopt. Though they were more or less forced, it doesn't change this fact: they chose to take a child (who by the common idea of family is not theirs) and make him or her their own. First, they adopted my sister, K'Lee. Take it from a younger brother's standpoint, they had their hands full with her... but they couldn't turn off the love they had in their heart. Three years later, they adopted me at 6 months old. I grew up knowing I was adopted. Some people keep it a secret from their children, but all my life I knew that I came to be part of this family in a way different than most people. My parents went out searching for me and God placed me in their arms. Not willing to be restricted by the normal means of building a family, they reached out to two kids who really needed a home... and gave us the best home we could have. Family was something that K'lee and I knew well. It may not have been formed in the normal way, but we knew we were loved... and we knew family. The idea to break out of the norm and go a different route to build a family was instilled in me for as long as I can remember. Fast-forward 27 or so years. During that time I've married my best friend and have found a faith that is relevant and alive to me. Anna and I work side by side to help further the Kingdom of God here... now... right next to us in Waco, TX. When we started discussing how our family would be put together, I never really felt all that excited about having biological children of my own. It just never felt like what was right for us. Yet the day that we began to talk about adoption as a possibility, it just clicked. This is the right path for us! This is what God was leading us to the whole time! Looking at the world around us, Anna and I see so much hurt and pain. We can look overseas at the extreme poverty, starvation, and orphanage there. We looked right out our door and realized there are children needing a home right in our neighborhood. Without getting into a debate about which is more important (because it's a dumb debate. Both are extremely important needs in our world), we decided that our hearts lie in our local community. We decided to look into adoption from here in the States. Long story short, adoption has morphed into Foster Care. We'd love to adopt through it, but we view Foster Care as a way to work for the Kingdom here and now, and we'll let God handle how our family comes together. It's scary, yet exciting. It's complex, yet one of the easiest decisions we've made. We don't know what is ahead of us. We'll be leaning on all the loving people surrounding us in this process, but I personally know we can do it. We'll follow the example of two Godly people who looked outside the walls of their home, made drives from a rural town to the huge city of Ft. Worth, sacrificed so much to bring in two children who needed a home, and made a family. Click here for Day 1. Click here for Day 2. Click here for Day 3. And that brings us to Day 4! Y'all, I started and finished a remodel project in 4 days. Anyone who is familiar with our dining room debacle knows that this is a big success. At the close of Day 3, everything was painted, the floor was installed and we had put the washer and dryer back in their place. Monday evening I put everything else back in there and somehow it looks a whole lot less cluttered than before. Probably because I said "where the heck did this come from?" to a lot of items which then ended up in the trash. 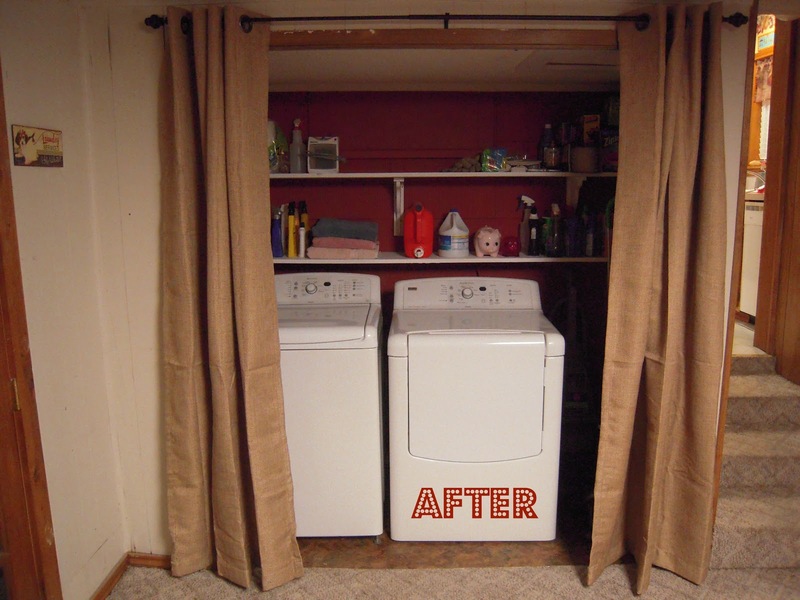 The last step was to hang a heavy duty curtain across the doorway so that the room can be closed off...though I don't know who would want to hide such a pretty laundry room. How about a little before and after for the full effect? Big improvement, if I do say so myself. Don't worry, I'm going to take the curtains down at some point and iron all those creases out of them. I was just too excited last night to do that step and just wanted to get them hung. Now for a little budget breakdown of what it cost us to spruce up this little 4 x 7 room. Though that is a decent chunk of change in our financial realm, it's not too bad for an entire room re-do. About half of it was spent on the stinkin' curtains and rod, but those are the ones I wanted. We're not sweatin' it. We're just lovin' it. Here ends my laundry room shenanigans. Up next I've got a very special guest blog post from a very special man in my life. Stay tuned for a glimpse into Trent's story and how it helped guide us to the foster care path we are starting on. To get you up to speed, click here for Day 1 of the laundry room remodel and click here for Day 2. They are just adhesive linoleum squares. Nothing too fancy, but my slogan for this entire project has been "it's just a laundry room", meaning I haven't gotten hung up on perfection or fanciness. After church, Trent wasn't feeling well so he konked out in bed for the afternoon and I set to work installing the new floor. It was easy. Just peel and stick. Man, were these things sticky. I used a utility knife to cut some down to size for the back row and certain corners where the regular squares wouldn't fit. TA-DA! I know it's just linoleum squares but I'm in love with it. Trent later awoke from the dead and put the shelves back into the room. I left the original L brackets in place for the lower shelf because a) they end up behind the washer and dryer and not really seen and b) they were weirdly stuck behind a piece of plywood weirdly covering the bottom part of the wall and there was no getting them out without tearing the wall apart. But for the top shelf, Trent installed the pretty brackets he made the day before. Pretty neat huh? Oh, did I mention I installed a beautiful new floor all by myself? Oh I did mention that already? I'm sorry. Actually no, no I'm not. That floor is schmexy. So at the close of Sunday, all the actual remodel type work was done. We went ahead and shoved the machines back in there and hooked them up so we could actually walk around in the den again and introduced the carpet cleaner and vacuum to their new home. Then Trent built a fire in the fireplace, in front of which we parked our booties for the rest of the evening. There is still one major piece left in this project, which I will update on as soon as it is done. Then I'll give some complete before and after photos as well. This pretty much consumed my weekend but I am SO glad I tackled it and got it pretty much done. Weeks of brainstorming brought to life. If you are just now stumbling upon this laundry room remodel adventure, click here for an update on how Day 1 went and get yourself caught up. Day 2 began bright dark and early Saturday morning. 6:30 am to be exact. Yipes. I wouldn't have gotten up that early for this on my own but Trent got up early to take some of his Mission Waco high schoolers on a college visiting trip to UTA so I went ahead and got up too. The early bird gets the painting done. I taped off the trim, spread out some plastic on the carpet and washing machine outside the laundry room, opened my paint can and got to work. It took me literally about two hours of cutting in on the edges with a brush, since there were so many nooks and crannies around pipes and such, and so many edges of the siding on the back wall. Once that was taken care of and I could switch to a roller, things went sooooo muuuuuch faaaaster. I did use a little weenie roller though because I still had some small spaces to get to. It was very easy to maneuver. First coat done by about 11:00 am. Time for a lunch break. After that, I set myself up to paint the shelves outside in the back yard on some saw horses from Trent's woodshop. They were a nice dirty shade of not-quite-white so I painted them actual white with a few coats of paint throughout the afternoon. Trent got home from Arlington at about 3:00 and set to work cutting, routing and assembling some decorative, but also very functional, shelf brackets. I did not want to use the original metal L brackets again (hence why we yanked them out) and intended to go get some kind of pretty swirly metal brackets at Home Depot but they were about six buckeroos a piece. Ew. As we were standing there bemoaning the price, Trent said "why don't I just build some?" Duh. Brilliant. And since I was planning to ditch a couple of the small shelves from the laundry room and not reuse them, he could just make the brackets from those. Brilliant and free. As he kicked them out in the wood shop, I set to painting them. Aren't they pretty? We've got a nice sized laundry room/closet/nook in our house that is located in our den, behind the kitchen. Over the last few weeks I have been brainstorming a plan to give it a face lift. It is was very white, very blah and very out in the open, considering the folding doors that belong there have been broken and off their track pretty much since we moved in. Something needed to be done. I began to tackle my plan last night (Friday). 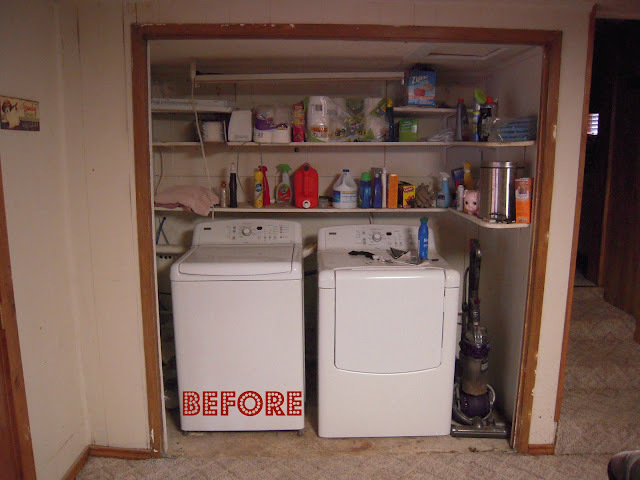 First, allow me to introduce you to our laundry room, pre-remodel. Can you spy my piggy bank that holds money found in the laundry and Trent thinks is creepy? First I took down the little knobby things that once held a closet bar across the room, which I took down loooong ago because it was smack in front of the shelves. Then I took down the fluorescent light skeleton, also never used and in the way. Then I cleaned. A lot. It turns out that it can get pretty grody behind a washer and dryer. Blech. I cleaned the shelves, the floor, the walls. Speaking of walls, this room is on the edge of the add-on part of our house, or "house #2" as we sometimes call it, that came along sometime in the 70s supposedly. Therefore, the back wall of our laundry room is actually made of exterior siding. And there appears to have once been a window above the stove, which is on the other side of that wall and raised up to the pier and beam level of the original house (house #1). Scroll back up to the first picture above if you are confused and you can see the three steps to the right of the laundry room which lead up to the kitchen. And look at the picture below to see the bottom of the old window frame. The next step was getting the shelves out of there. I figured this would be a piece of cake, just some screws to remove from all the L brackets and slam dunk. Oof, I was wrong, because a) the brackets were nailed in, b) the nails were then painted in, and c) remember I said this back wall is made of exterior siding? Well, the siding on house #1 is called "soft side", which is kind of a misnomer because soft side is made of asphalt. Yep, our house is made out of road. These nails were about three inches long and didn't want to come out of our road siding very easily. I got most of them out but had to call in the expert for the remainder. Can I get a hoo ray for having a husband who used to build and repair houses? With that, I called it a night. Tune in tomorrow for an update on Laundry Room Remodel Day 2. To my faithful blog friends, some of whom I know in real life and some of whom just peer into my life from a distance, I want to share some news with all of you. Trent and I have had God on speed dial over the past months and we have found ourselves in a position of fear and joy as we seek out His plan for the way we will begin to build our family. I bet a lot of you out there have been thinking "Man, Trent and Anna have been married more than four years, have a house, cars, jobs...it's about time they had a baby." Anyone? Oh, maybe that was just me thinking that. Having a baby would be the logical next step in our life at this point. But the thing is, every time the inevitable baby conversation came up between us, we both ended up feeling pretty ambivalent about it. It's not the answer for us, at least not right now. God has had a different plan in store for our hopes of building a family. We have spent a lot of time over the past several months learning, discussing, praying and seeking. We are going to become foster parents with the hope of eventually adopting. We are excited, we are nervous, at times we are completely freaked out. We have thanked God for making this so clear to us as the path we should take and also asked Him if He is being f'real and is actually serious about this. We know this is different. We know this is not the norm. We know y'all may have a whole lot of questions for us about this. Never fear, I've already got several foster and adoption related blog posts in my drafts line up. In the meantime, please just ask us. :-) We would be so happy to share our heart with you, fill you in and keep you updated. For now at least, I have thrown together a quick who, what, when, where, and why list so you can have a general idea of what we are headed towards. ~The Bair Foundation, a Christian foster care agency that we have signed on with. They work directly with the Department Of Family Protective Services and Child Protective Services and will train us, support us, and place children with us. ~The children God brings into our home and into our life, whether it is for short amounts of time or the rest of our lives. "Red and yellow, black and white, they are precious in His sight." Foster care with the hope of adopting. Some folks want to be foster parents and have no intention or ability to adopt. Some just want to adopt and bring a child into their family permanently without the unknown of the child possibly being reunified with their biological parents. We are in the middle. I think we are technically called "foster to adopt" parents which means that we are going to sign up to be regular foster parents for the times when that is needed of us, but we have the hope and intention of adopting if that becomes a possibility with a child or children. We have done our orientation and will chip away at our licensing paperwork and home study this Fall, do our in-person training classes in January, push pause for tax season even if we are licensed by then, and will be open for our first placement around next April. That's the timeline for now, but we have learned that nothing is guaranteed in any aspect of this process. The state's goal is to keep children as close to their home as possible, so we will likely take care of children mostly from our own county at least, possibly surrounding counties. But the home base for our time with them will be just that: our home. They will be a part of our home no matter what they have been through or what they are headed towards or how long or short they are in our care. Where to even begin... Because Trent and his sister are adopted so it is already a part of our family story. Because God has called me and Trent to this. Because this makes so much sense for us and is the answer to our kid question right now. Because God calls us as Christians to take care of orphans (James 1:27). Because our life isn't about us. Because we are blessed with a safe and happy home and there are kids out there who are not. So friends, here we are, setting out on a new adventure, and boy is it ever a big one! We ask for your prayers as we navigate the process ahead of us in the coming months. We are learning, listening, praying, seeking, answering. I want to share a quick story with you. And then I want to tell you something very important, kind of like why women wear high heels and how you shouldn't be expected to read your wife's mind. Actually, it's more important than those. Several weeks ago I was at work, chatting with my coworker Tom after dropping off a tax return at his desk for him to review. It was shortly after Trent and I went on our first scheduled Friday night date night when Trent gave me some flowers. As I was describing my roses from Trent, Tom suddenly turned to his desk, grabbed a post-it note and began to write something on it. "That reminds me, I haven't gotten flowers for Claire in a while." Claire is his daughter. She is three. I melted. After I picked my jaw up off the office floor, I praised him profusely for such a wonderful, sweet, loving habit. Men, show your daughter how men should treat her. Show her through your actions what it means to be respected, supported and loved. Be a model of responsibility and hard work. Tell her she is pretty. Be there for important events in her life and be there for Tuesday night homework. Buy her flowers. Take her on daddy daughter dates. Dance with her in the living room. Set the bar high for what her expectations will be of future men in her life. Someday maybe she'll meet a man who doesn't live up to these standards you set throughout her formative years. Hopefully she will fall back on that foundation of love, respect and presence and say adios to any losers she comes across. Someday maybe she'll meet a man who will start doing all those things that you did so faithfully as she grew up. He will love her and respect her. He'll be there for her when she gets a promotion and he'll be there for her when she's dishing out spaghetti for dinner...again. He'll buy her flowers and he'll dance with her in the living room. When that time comes, you may not get to do these things as much anymore. But you'll know that you helped her set high hopes for that next man who became a constant, honorable, loving part of her life. Once upon a time, my baby sister was actually a baby. Abby turned 16 today. WHAT?!?! I know, crazy right? It seems like not that long ago we big sisters were trying to ditch "the munchkin" in order to go shopping and now she's pretty much the MVP of our sister pack. Anyway, I had a little fun with her birthday present. Or should I say presentS. I figured since she was turning 16 she needed 16 birthday presents. Since I am not made of money, however, the first 15 were a whole bunch of random silly stuff, each costing $2 or less, including glow in the dark slime and "Say Yes To Carrots" lotion. Hey, I already said they were random ok? The 16th present was actually a real present for my sweet baby sister. I stuck all this in the mail to Abby and phoned home this evening. Mom answered ("Hi Pie!") and then told me Abby was about to open my box. Good timing! I got to hang out on speaker phone while she opened each present. She dove in and started with the nail polish, number 11, before I told her to go in order, or at least make sure to end with #16. It was so fun to listen to her open each random, silly present and the real present at the end. So happy 16th birthday to my baby sister. I lobbs you! Even though we recently started being more official and intentional about Friday night date nights, Trent and I have always randomly planned "Mystery Date Nights" for each other. The ones I plan are pretty lame and usually entail revisiting certain sentimental spots around Waco like the suspension bridge where Trent asked me to be his girlfriend or the little garden area behind Morrison Hall on campus where we had many conversations during college about us and our future. But the mystery dates that Trent plans are totally unique, bookoos of fun and downright awesome. Clues: We will be outdoors and it's hot so wear shorts. We can go any time after we eat and it will cost about $20. Resulting mystery date: Watching a motorcross competition at the HOT coliseum, from age 4 through adults. It. Was. Awesome. Some people implied to me that they thought that was a really lame date but I loved it. It is now a prominent memory on our "Remember That Time" list. Well, last week Trent started talking up a Mystery Date Night for this past Friday. All I could gather as clues was that it was "western themed" and I should wear my cowgirl boots. I later gathered that 8:00 pm was a fluid arrival time. That was it. He said if I asked too many questions the date would turn into McDonald's and a drive back to the house. Well, fine. He took me to dinner at a new-ish place downtown called Jake's Texas Tea House. It was really good home cookin' and a super fun atmosphere but, not gonna lie, we agreed it was a leetle beet pricey. After dinner, we killed some time including a trip to our now deceased steakhouse to take a picture and mark the end of an era. At this point I still wasn't sure why I had to wear my boots or what was so western themed about this date. Then Trent took me dancing. Y'all...Trent hates dancing... But he knows I love it. And that was his sole reason for surprising me by taking me to Wild West dance hall. The place opens at 8:00 but people don't really show up until about 10:00...which is now our bedtime... Trent and I were literally the only ones there besides the bartenders and the DJs but that was actually perfect. We were there to dance with each other, there was nobody else to run into or keep up with on the dance floor. It was just us, dancing. We stayed for about an hour, danced several songs, sat and chatted a bit, probably looked like a couple of major dorks. At one point Trent asked me if I was embarrassed that we were the only ones there and I told him no I was not. I was just happy to be dancing with him. Giddy actually. Did I mention Trent hates dancing? When was the last time you did something for your spouse, even if you don't like it or don't want to, just because you know they love it?